New CPU architecture boasts 40 percent better IPC than Excavator. AMD hasn't really been a serious contender in the CPU space for a few years now. It's not that they're too slow for gaming and other uses, but they've lagged behind on features and in the majority of workloads fail to keep up with Intel's alternatives. You might save a few dollars, but it's at the cost of performance and/or power use. Things are shaping up for all of this to change once AMD launches their new Zen processor architecture, and this week AMD showed some public performance demonstrations. As with all such demonstrations, take the results with a grain of salt, since AMD only showed one specific benchmark, in this case Sony's Blender 3D rendering application. I've seen tests showing the i7-4770K beating the FX-8350 by about 50 percent, however, which is about on par with what I've seen in other CPU-centric workloads. AMD didn't provide exact scores but instead showed their 8-core, 16-thread Zen chip facing off against a Broadwell-E 8-core, 16-thread chip. The catch here is that both are clocked at an identical 3.0GHz. The result, as you might have guessed, is that AMD wins—not by a lot, but anything close to parity with Broadwell-E is welcome news. You can see the actual benchmark run at the 1:28 mark in the video. AMD is using an engineering sample for Zen in this demonstration, so clock speeds are very likely lower than what we'll see with shipping hardware, but we don't know exactly where clocks will fall yet. 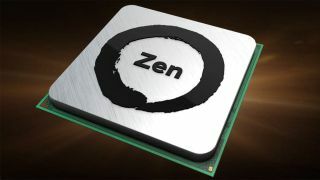 The Zen chips will probably end up with similar clocks to their Intel counterparts, and AMD is planning a full set of Zen products, including APUs and CPUs with core counts ranging from two or four cores (plus SMT) and up. How high will core counts go? AMD also demonstrated their 'Naples' processor, a server-class chip with 32-cores (64-threads), running Windows Server. No benchmarks were presented, but the highest core count from Intel right now is 24, and 33 percent more cores of similar performance would be a great showing. All of this is made possible by new process technologies and a complete redesigned architecture. Gone is the 'Bulldozer' series of cores, where each module featured two integer cores with a shared floating-point core. In its place is something far similar to Intel's designs, with SMT (Symmetric Multi-Threading, aka Hyper-Threading in Intel's chips) allowing for two threads to share resources for each core. The pipeline, branch prediction, buffers, instruction fetch and dispatch, and other elements have all been tuned to improve performance and reduce wasted power. AMD also has an L3 cache, which appears to be 8MB per four cores rather than a globally shared L3 cache. Perhaps most important in all of this is AMD's move from 28nm and 32nm planar fabrication on their previous chips to 14nm FinFET for Zen. Much like in the GPU world, transitioning from an aging process to a modern FinFET alternative allows for more transistors and lower power. Combined with the above architecture overhaul, Zen should be the most competitive AMD processor in the past decade, boasting a 40 percent IPC (Instructions Per Clock) improvement over Excavator / Carrizo. Intel has been improving IPC by about 5-10 percent per generation on their Core chips, steadily increasing their lead over AMD, but a 40 percent jump could erase much of the current deficit. You'll need a new motherboard, socket, and chipset to go with Zen, but that will get you DDR4, NVMe, and USB 3.1 10Gb among other updates. Zen is also slated to launch via OEMs before the end of 2016 (similar to AMD's Carrizo / Bristol Ridge), with retail boxed processors coming later—probably early 2017. If you've been holding onto an old AMD FX-series part for a few years, AMD's message is clear: They're back, they have some great hardware, and they're coming out swinging.